It’s true, though! Since the great deluge of February and early March ended on March 14th, it’s been awfully dry around here: too dry, in fact. We’ve only had 0.1″ of rainfall in the past two weeks; that’s 4.5% of normal compared to the 17.08″ between February 1st and March 14th. Your eyes do not deceive you. 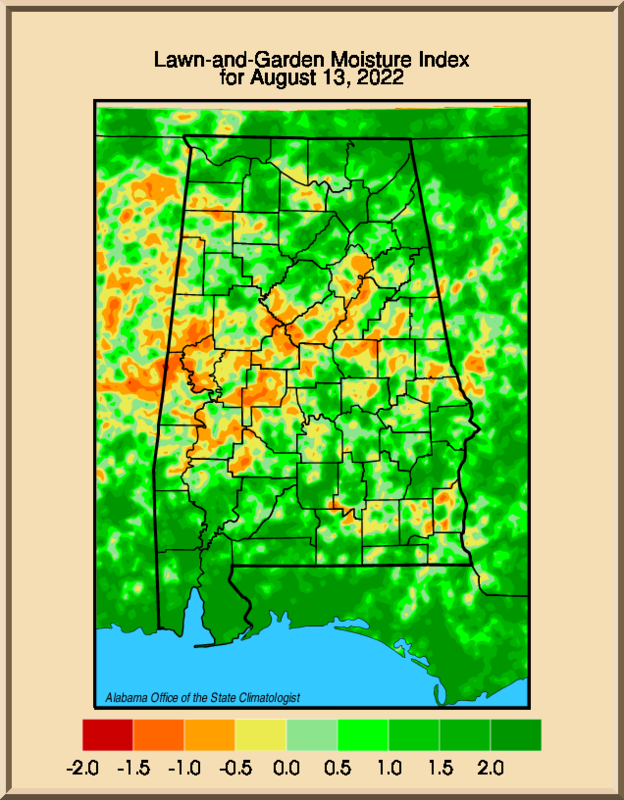 That is a current map showing a state of dryness for most of Alabama as well as Southern Tennessee. We need about one-half to one inch of rain to keep pace with healthy soil moisture for lawns and gardens. If it doesn’t start raining again soon, you’ll start seeing sprinklers and irrigation systems coming online a little early to give the thirsty soil a drink! The long-term indications for the Spring season tell us there will be more rain: maybe a LOT more, too. Weekend rain & flip-flop: The warm dry weather only lasts so long this time of year; March and early April often bring chaotic weather patterns with rain, strong storms, cold snaps and occasional stretches of pretty weather, too. Friday is the last of the ‘pretty’ days for a little while: highs in the 70s, partly to mostly sunny, and a south breeze. A cold front northwest of Alabama and Tennessee Friday stirs up some severe storms in Oklahoma, Missouri, Arkansas and Kansas; however, that same kind of set-up does not develop around here as the front moves in Saturday. Instead of widespread severe storms, we see some potential for a few locally-heavy storms Saturday evening through early Sunday morning. ‘Locally-heavy’ means a few isolated storms that could kick up the wind, make some noise with booming thunder, and produce some small hail. A wave of light showers passes through Saturday morning between 5 AM and 10 AM. After that, there’s a break in the rain for about 10-12 hours before the main wave of rain and embedded thunderstorms moves in ahead of the cold front. No Saturday rain-out! See the timing here before you cancel/change plans! Total rainfall between 7 PM Saturday and 7 AM Sunday looks small for a March storm system: around 0.10” to 0.35” in all. Colder air and drier weather move in behind the front for Sunday; stubborn clouds and a northwest breeze keep it chilly Sunday afternoon. More frost possible! Spring planting is so close, but we’re still not out of the frost/freeze season! There will be a good chance of frost Monday morning (a freeze in the usual cold spots like Valley Head, Russellville and New Market). Chilly air early next week lingers a while, but warmer weather wins out by the end of the week! Longer-term ideas keep it warmer-than-average through the first half of April, and it very well may be April 7-10 before we see our next chance of heavy rain and some storms.